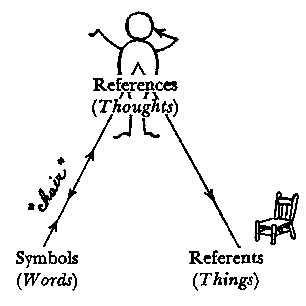 The "triangle" of meaning6 shows the relations between words, thoughts, and things. At the peak of the "triangle" is a human being. Here is either the user of wordsthe person who has selected the wordsor the recipient of the words who must, from his perspective, entertain7 those words. 61 have taken the liberty of putting a person at the peak of Ogden's and Richards' hare "triangle." See The Meaning of Meaning, p. 11. Also, at this point, touch a chair or point to a chair silently. You can't sit on a sketch (which is, itself, a nonverbal symbol).